We break big, complex processes like building your email list and growing a successful YouTube channel into small, actionable steps you can put into practice straight away. Sometimes, we share our favorite tools and help you build your own custom toolkit. At DottoTech we are all about the conversation. We want to create something unique that helps you get to where you want to go. That’s why, for the second part of every webinar, we answer your questions on the day’s topic. Join us this Wednesday for a taste of the Dotto Tech magic. Every Wednesday the DottoTech team goes live with a brand new webinar. Want to stay up to date with everything that’s going on at Dotto Tech? Sign up for our newsletter. 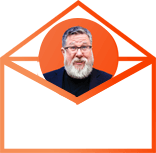 This isn’t just your average I will send you a bunch of emails you don’t want to read kind of newsletter. Here’s how it will go instead. Ready to improve your digital skills? Choose your path and sign up for one of our free courses.